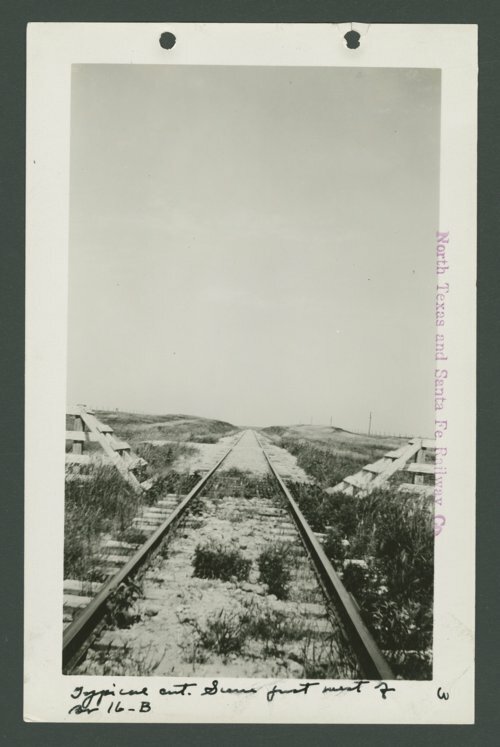 These three photographs show views from the North Texas & Santa Fe Railway Company line. The first image is a view of a typical cut along a railroad bed. The second image is a view of a concert pipe running beneath the tracks. The third image shows a layer cut into gypsum rock along the tracks. The rail line, chartered in 1916 as a subsidiary of the Atchison, Topeka & Santa Fe Railway Company, ran from Shattuck, Oklahoma to Spearman Texas. In the 1920s the rail line was later leased to the Panhandle & Santa Fe Railway Company for operational use.